A new edition of the “What’s Happening at Heritage” catalog is now available, with detailed information on 57 distinct events, activities, groups, and meetings. You can pick up a paper copy in the foyer of the church. 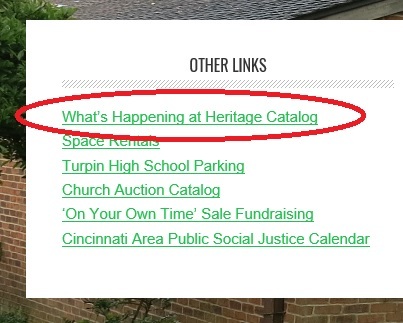 Or, on any webpage of the church’s website, look in the lower left under “Other Links” and click on the link for “What’s Happening at Heritage Catalog.” Or, right now, you can access it directly here.